Learning about a vendor's food, freshmen Lacie Perry and Ally Johnpress taste test cafeteria foods at the Flavor Fest on Feb. 6. Regulars in the cafeteria know the classic potatoes and gravy, tater tots and cheeseburger, but with the district’s fourth annual Flavor Fest this morning, underclassmen can expect some changes to their menus. 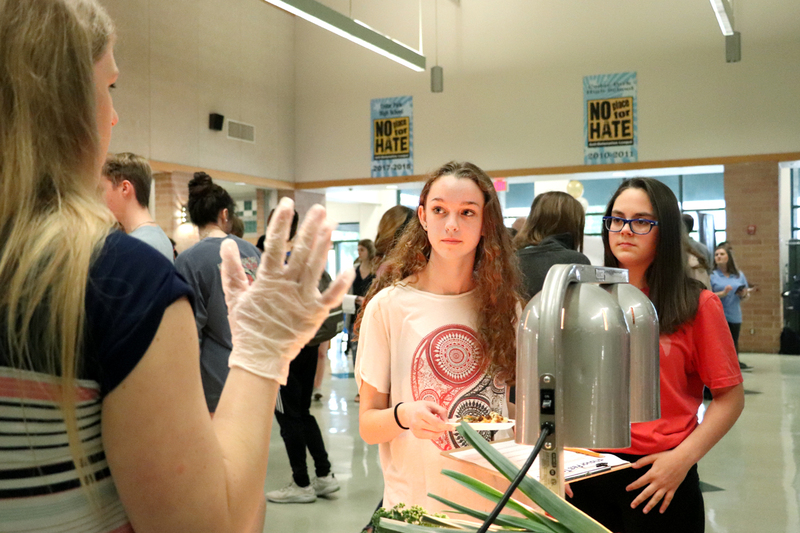 At the Flavor Fest, students were brought in to try out new cafeteria foods and record their feedback on a form, which Child Nutrition Services is using to better accommodate students’ likes and dislikes in next year’s menus. Each year, the Flavor Fest has rotated between the high schools, such as Vista Ridge, Vandegrift and Leander. Middle and elementary school students who feed into Cedar Park were bussed in this morning to give their feedback as well, since the menus will also be made according to grade. Andrews, who led today’s Flavor Fest, said that this event is a way for the department to best learn how to accommodate their students. “We have constraints in terms of what we can serve and federal nutrition regulations, but we have some flexibility to find out what our customers are looking for and how we can accommodate that,” Andrews said. Elise Fournier, a sophomore who attended the Flavor Fest with her theatre class, said that while she does not buy her lunch often, this event showed her that the district cares about student feedback. Although not all cafeteria customers are aware, there is now an app called Nutrislice, which allows students to see a daily menu that includes the nutrition info and allergens in every cafeteria food. Within the month, Nutrislice will give students the option to create a custom lunch, pre-order it and pick it up in the Grab and Go area of the cafeteria. The assistant general manager for Child Nutrition Services, Robin Plett, said that this service is being made to ensure that even the busiest students can have time to grab lunch during the day. If students download the app, they are able to leave a review on any cafeteria food they purchase. Plett and her department frequently monitor the feedback, and she said that if they see that students are experiencing a problem with their food, she will get in contact with the cafeteria manager to find a solution. 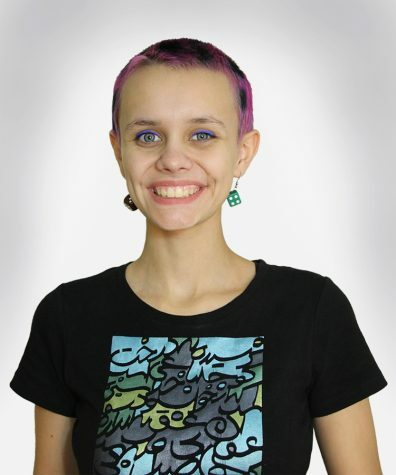 Freshman Jeweleah Long, who frequently buys lunch in the cafeteria, has allergies to several foods including carrots, apples, watermelon, peaches and bananas. With the app, Long can have access to nutrition information to know which foods are safe for her to eat. Until the Flavor Fest came this year, students like sophomore Caitlyn Smith have never given their feedback regarding the cafeteria food. Smith said that reviewing the food and being introduced to Nutrislice this morning has made her feel like she has more of a say in what goes into the cafeteria. 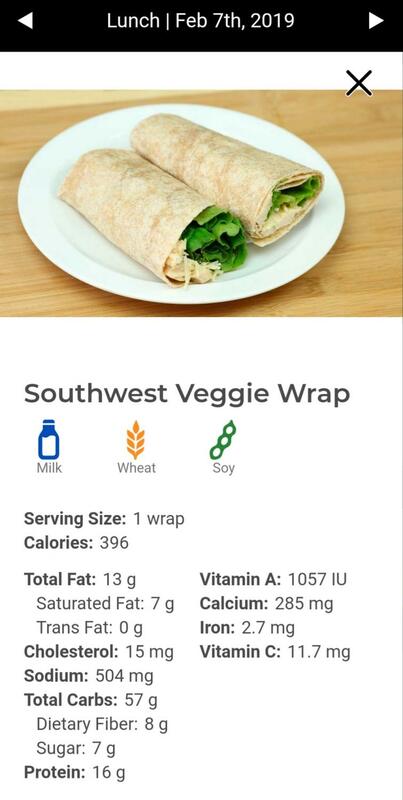 The Nutrislice app is available for download in the App Store and Google Play Store.